Fabinho was closer to Auston Trusty than he was to his correct position, and it allowed Harrison Afful all the time he needed to make a dangerous shot at the far post. 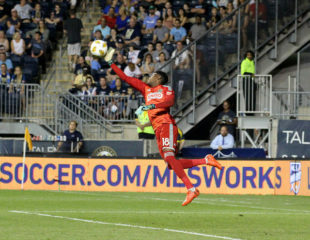 Luckily for Union fans, Andre Blake delivered some of his signature acrobatics and blocked a shot that no one would have blamed him for missing. He even had the presence of mind to push it up, and away from the feet of a charging Justin Meram. That only scratches the surface of how thankless goalkeeping is though. Because as amazing as that save was, no one is really talking about it. Maybe it’s due to the positive but unenthusiastic result on Saturday night, but it could also be due to the fact that Andre Blake makes saves like this all the time. Long gone are the days where he could stun opposing fans into slack-jawed shock, now it’s pretty much expected that he’ll make one or to amazing saves per game. So Andre Blake is our player of the week. Not just for his performance against Columbus, but for all the other times he’s been amazing this season without getting the recognition he deserves. Like the way Brooks Robinson was defensively at third base for the Orioles when I was a kid, or Lev Yashin must have been in the mid-60s for the Soviet Union.